Beijing Olympian and WSB star, 23-year-old Brazilian Everton dos Santos fought against University World Champion, Ukrainian Denys Berinchyk. The Light Welter was the only boxer among the finalists coming from the last 64. Thus the Ukrainian was probably more tired than the South American. The Brazilian athlete dominated the fight in the first three minutes and was leading by 8:3 before both boxers received public warnings in the second round. Lopes kept a four points advantage. The last three minutes brought a real manly fight resulting with a close Brazilian victory: an historical gold medal for the South American country. On the opening contest of the day, China's only finalist in Baku was Beijing Olympic Games winner and twice AIBA World Champion, 30-year-old Shiming Zou who fought against current Asian Champion, 22-year-old Korean Jong Shin who secured bronze at the last edition of the Championships in Milan. The Chinese light flyweight dominated the fight in the second round to lead 13:6. Although Shin gave his best in the last round, Zou used all his skills to win his third World Championships title by 20:11. Shiming Zou becomes the first boxer to win three gold medals in the history of the lowest weight division. Andrew Selby was the first Welsh who could secure a gold medal in a European Championships and reached the flyweight final after beating Uzbekistan's Jasurbek Latipov. But he was facing a very powerful rival in the final: European Champion, Russian Misha Aloyan. Aloyan was leading 4:2 after three minutes before the tall Selby was excellent in the second round. The very close contest ended with a 13:12 victory for Aloyan who win his first World Championships title. European Champion, 24-year-old English Luke Campbell had several victories in international tournaments in the recent past. His opponent in the bantamweight final was Cuba's rising power, former AIBA Cadet World Championships silver medallist, Lazaro Alvarez, newcomer in the Cuban national elite team. The 20-year-old Cuban dominated the first round before raising his advantage in the second three minutes. The Caribbean youngster finally won the tactical bout by 14:10. Beijing Olympic Games winner, defending AIBA World Champion and Ukraine's superstar, Vasyl Lomachenko won every single tournament he participated in during this Olympic era. Today he fought against Pan-American Champion, Cuban Yasnier Toledo in the lightweight final. Lomachenko, who moved up a weight class since the last edition of the Championships, knocked down his opponent with a right hook in the first round when he was already leading with a three points advantage. Lomachenko secured his second World Championships title, winning the contest by 17:12. Kazakhstan's team captain, 28-year-old virtuoso Serik Sapiyev is twice AIBA World Champion but failed to win a third gold medal against European Championships bronze medallist, Ukraine Taras Shelestyuk. If Sapiyev triumphed over his Ukrainian rival at the last edition in Milan, Shelestyuk found the right tactic in Baku to win the welterweight final by 16:10. Probable Ukraine's top middleweight, European Cup winner, Ievgen Khytrov and Asian Championships bronze medallist, Japanese Ryota Murata are the strongest boxers in this weight division. Their final resulted in a real battle ending with a 24:22 success to Khytrov. Despite his defeat, Murata becomes the first Japanese ever to reach a final in the history of the AIBA World Boxing Championships. Cuba's team captain, Julio la Cruz showed an excellent footwork during the championships and eliminated defending Champion Egor Mekhontsev from Russia. His opponent in the final, former Asian Junior Champion, 22-year-old Kazakh Adilbek Niyazymbetov moved up to the light heavyweight class only this year. The first round resulted in a balanced battle before la Cruz turned up the heat. 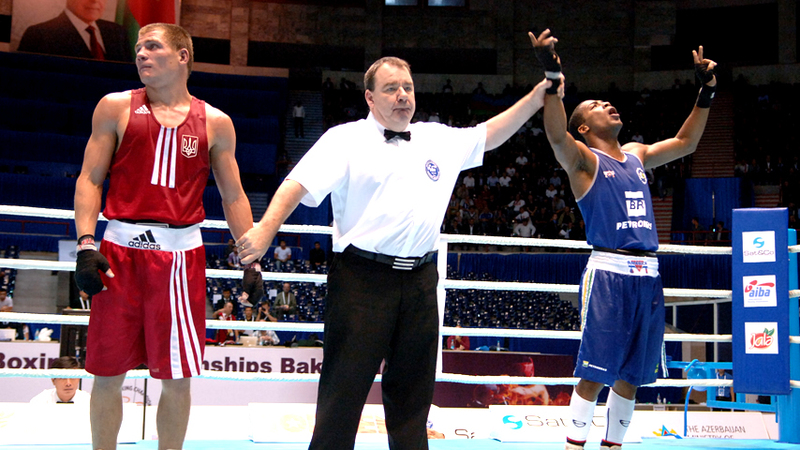 He finally won the light heavyweight final by 17:13 and secured a second Cuban gold medal in Baku. European Champion, European Cup winner and one of the best Ukrainian boxer, Oleksandr Usyk had only one loss in the last two years. His opponent for the gold medal was current European Champion teenager, Azeri Teymur Mammadov, the youngest competitor among the finalists. The experienced Usyk dominated the fight and acquired the fourth Ukrainian gold medal in Baku. That means the former Soviet Union country won the team ranking for the very first time in an AIBA World Boxing Championships. British Champion and European Championships quarter-finalist, 22-year-old English Anthony Joshua eliminated titleholder Roberto Cammarelle from Italy in the quarter-finals. His rival in the final, Azeri Magomedrasul Medzhidov secured silver at the WSB Individual Championships in May. Although Joshua was leading by 8:5 after the first three minutes, the local hero could turn the fight in front of an amazing crowd to win the super heavyweight final by a narrow 22:21. Medzhidov was in the end awarded the best boxer of the tournament trophy.